“Practicing” says something about what i do; “face” and “meet” say something about what i am trying to do; “equality” says something about what i am now exploring. As if i had landed in the horizontal plane after spending quite a bit of time in the vertical planes of genders and selves. Low-powered narrow-casted radio and sometimes online streaming are my current partners. And i am not finished there. Radio Equals will be a daily hour of narrow-casted and internet streamed one-on-one conversations during which i will collect examples of egalitarian actions. Landsgemeinde will present the list of collected ideas and we will engage in a democratic process to choose one single action that we will individually commit to do after the festival. claude wittmann was born in Switzerland and now lives in Toronto. He works as a bicycle mechanic and as a performance artist, mostly in Toronto. He is grateful for the influences of SU-EN, Paul Couillard, Sylvie Tourangeau and Eric Létourneau. 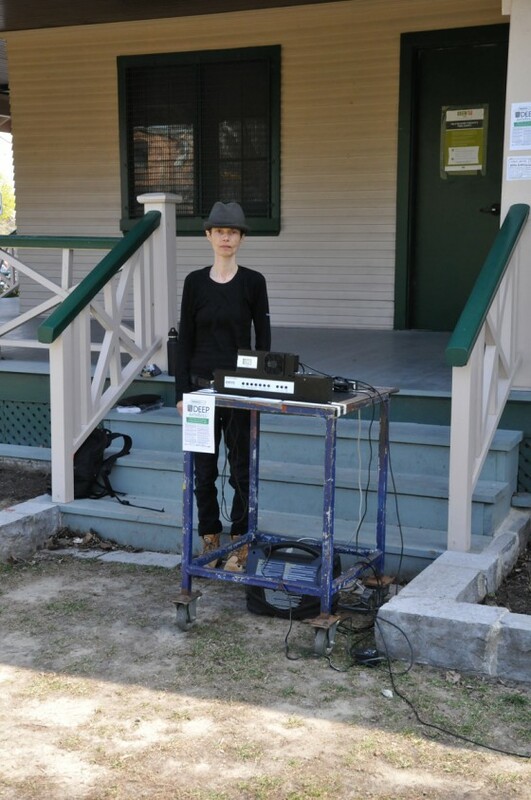 Radio Equals internet streamed through New Adventures in Sound Art. This is one of two collaborations with local artists undertaken by 7a*11d 2010 Éminence Grise Sylvie Tourangeau. “Since 1978, I have produced public performance actions and written about other artists’ practices. In 1984, I began offering intensive workshops for groups. These three fields of action inform my research into the manifestations and awareness of the performative. “From the beginning, I have tried to foreground the transformative potential of performative actions. Very simple actions conceal a complex intimacy, mundane objects take on unsuspected meanings, the embodiment of presence generates a great power of ritualization. Within this exchange ground of the here and now, nothing is taken for granted. Is it my capacity for letting go, outside of what I view or imagine, that transports me to the heart of ‘otherness’? “In performance situations or in the context of projects dealing with a relationship to the Other, I often invent one-off rituals, using trivial objects and simple gestures. I try to actualize the transformative power conveyed by human presence: integrity, intimacy, the coexistence of differences, belonging to the social, the evolutionary power in the perception of the present. “While my actions may appear simple, they reflect complex worlds, multiple sensations, small truths worth questioning. Thus I avail myself of analogy, of metaphor, of the coexistence of extremes, of a certain deadpan humour, and of a fragility altogether … redemptive. My individual research within several artists’ collectives and with the participants of my performative workshops has led me almost imperceptibly to develop a lexicon, a practice of presence, an active pedagogy around awareness of the present time, authenticity, state of mind, and the channelling of gestures. I have developed notions such as the dynamic of motivation-connection-amplitude-action; the in-between action; etc.